Home/career choice/What Career Path Leads to Success on Survivor? 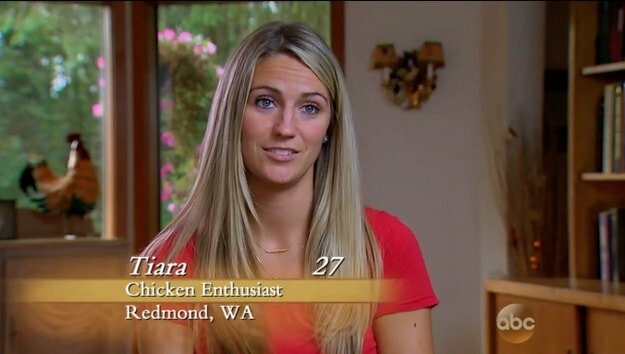 Recently we wrote about what career has been historically most successful on The Bachelor. In this post, we turn our attention to reality TV’s most well known strategic competition show Survivor. Survivor has been on the air since 2000. 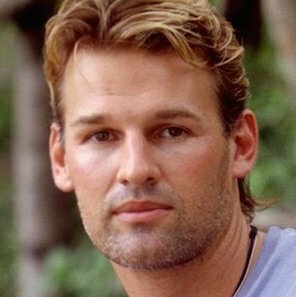 With 32 seasons (roughly two per year), almost 500 people have played Survivor. Each season, we see similar casting types and archetypes. Fans of the show know that CBS casting loves to create diverse casts of models, farmers, struggling actors, doctors, lawyers, and beauty queens. But who gets cast the most? Are some careers better suited for Survivor challenges than others? Does your career impact your performance? To answer these questions, we collected all the relevant data, crunched all the numbers, and have come up with some amazing results. 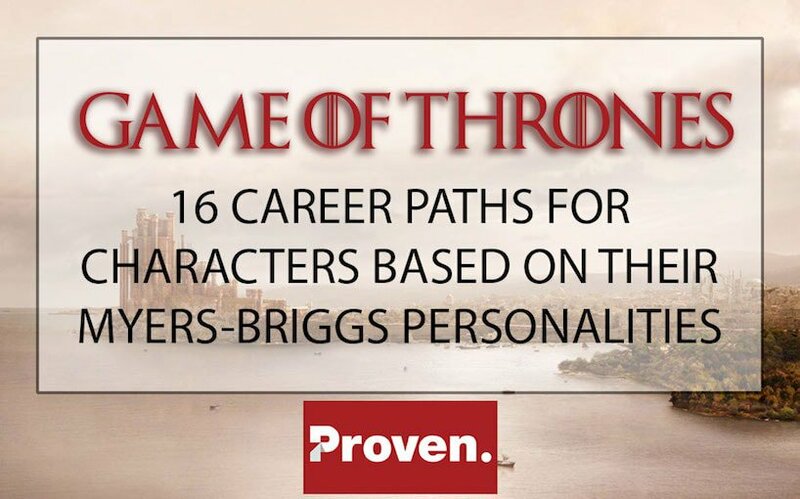 Keep reading to learn if your career path is destined for reality TV glory! Bonus: Save time with your next hire, and use one of our free job descriptions. What careers are most common on Survivor? 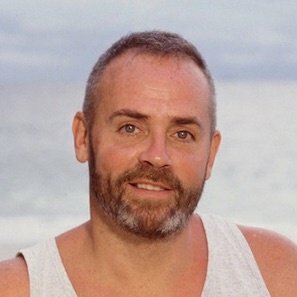 Starting with the list of every unique contestant that has played Survivor (not counting the on-going season), we collected their declared occupation from their CBS bio’s. We further re-classified everyone’s listed job into occupational categories. For example, if someone’s job is listed as “trial lawyer” or “ER doctor”, both of those contestants would respectively be placed in the categories “attorney” and “doctor”. With each contestant and any performance-related data that we analyzed, we only considered their first season of Survivor, no all star or other repeat performances. 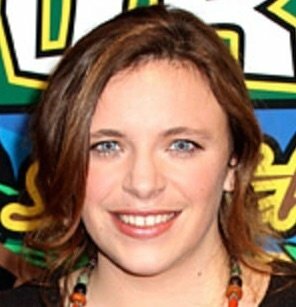 Also, please note that although some contestants are perhaps now better known for having certain jobs, Rob Cesternino as a podcaster or Sophie Clarke as an M.D. fellow/analyst, we only considered what their listed profession was when they first played the game. This yielded 107 unique careers for Survivor. Discounting any career with less than five appearances on the show, we ended up with 30 unique occupations that we will use for the bulk of our analysis. Below we show the 30 most common careers of contestants on Survivor. The median number of appearances is 11, and if we discount the two outlier careers of student and sales, the median is 9 appearances. Not too surprisingly, the student category is the most common occupation with 41 appearances. Students generally have a lot more flexibility in terms of being able to take several months off to compete on Survivor. The median age of a student on Survivor is 23.7, making it the second youngest category next to adventure guide, which has an average age of 23.6 (more on this in the next section). 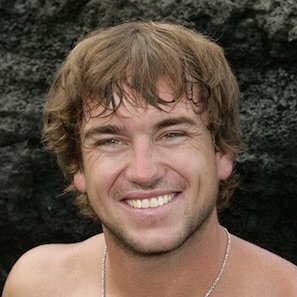 Being younger likely makes these contestants more capable of handling the physical demands of the show, have less day-to-day responsibilities, and perhaps fulfill any Survivor requirements about looking nice in a bathing suit. Digging into the student category further, the most common type of student is a law or pre-law student, with 9 casting appearances, followed by medical or pre-med with four appearances. Both full attorneys and doctors are within our 30 most common Survivor careers, so it’s not too surprising to see so many students on similar career paths. The other big category is sales. This category encompasses a lot of different types of sales jobs, but the most frequent is pharmaceutical sales with 12 appearances! Notable players coming from the pharmaceutical sales profession include Corinne Kaplan and Survivor Somao winner Natalie White. Below we show the five most common occupations along with that category’s best finisher. What is the age range for Survivor contestant occupations? The graph below shows the contestant age breakdown by job category. The bottom of a vertical line for a category corresponds to the youngest person to ever play with that particular occupation, the top of the vertical line is the oldest, and the triangle is the average. Our oldest contestants are found in the categories of executive and military. Since our military category includes retired military personnel, this makes our age range the largest of any group. We have Rudy Boesch competing his first time at 72 years of age and Shamar Thomas at only 27 years old. The two groups with the least variance in age range are adventure guides and food service workers. There’s only a five year age difference between the youngest and oldest adventure guides to play and an 8 year difference for food service workers. 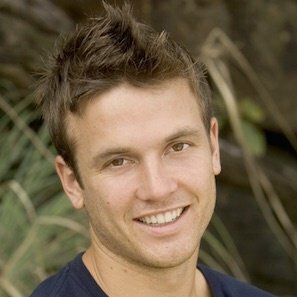 The average age of a contestant on Survivor is 33 years old while the average age of a winner is just under 32. There are only 6 career categories with an average age more than one standard deviation away from the average age of a Survivor winner. These categories are: adventure guide, executive, farmer, military, nurse and student. Despite these categories being outside the norm on Survivor, three winners have come from half of these categories and are shown below. What career is most successful in challenges? A large part of the pre-merge game in Survivor revolves around team-based challenges and post-merge, individual challenges. 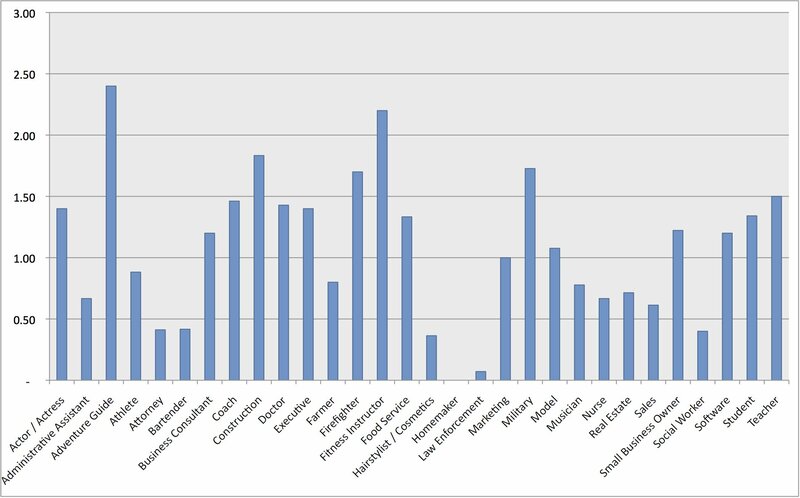 In this section, we look at our top 30 most common contestant occupations and compare their performance in both team-based and individual challenges. Starting with team challenges, below we show the average number of challenge wins by career (larger number is better). Actors, business consultants, and software professionals have the best team records, while homemakers and musicians have the worst. Interestingly, the career category of athlete has a team challenge performance 31% below the mean team challenge performance while fitness instructor is 41% above the mean! One explanation could be that most athletes, Cliff Robinson, Jeff Kent, John Rocker, etc. , that appear on Survivor are retired while a fitness instructor is still actively working. The retired athletes may be a little out of shape in comparison to the actively working fitness instructor. Also, most of our fitness instructors teach yoga, which perhaps is better preparation for the types of challenges seen on Survivor, balance and endurance, versus throwing and catching a ball, taking hits in the NFL or dunking a basketball. Next, we consider individual challenge performance. Below we show the average number of individual wins by occupation. The two big standouts from this graph are the adventure guides and fitness instructors. The adventure guide category contains both Kelly Wiglesworth, who is tied for the all-time individual win record for a female, and Rafe Judkins, who has three individual challenge wins. On the fitness instructor side, there’s challenge threats like Aras Baskauskas, winner of Survivor Panama, and his brother Vytas, both of whom have three and two individual challenge wins respectively. Finally, we wanted to look at the differences between team and individual performance based on occupation. To do this, we ranked each occupation by its position in team and individual performances. For example, actors / actresses would be ranked 1st in team performances but only ranked 9th in individual performance. 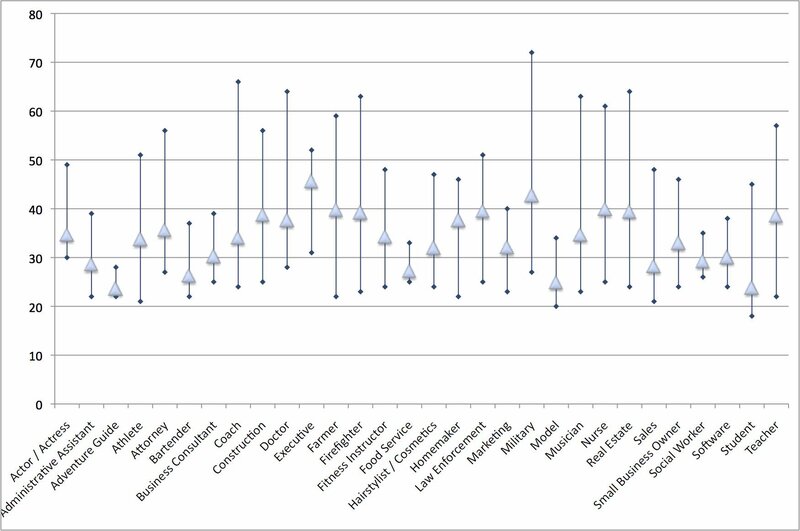 The graph below shows this rank comparison by category. The best possible rank is one, while the worst rank is 30. The career category with the largest change from team to individual performance is people with military backgrounds. This category has a rather poor historical performance in team-based challenges, but is one of the most successful individual performers. 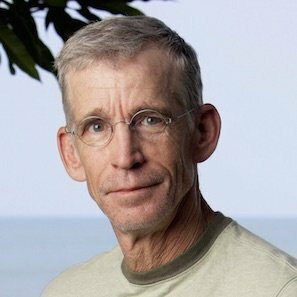 A big part of this success is due to Terry Deitz from Survivor Panama, one of the greatest individual challenge performers of all time. On the flip side, people working as hairstylist or in cosmetics have great team challenge records, but poor individual records. As interesting as looking at the team and individual challenge performances of participants on Survivor is, any big fan can tell you that actually winning the game often has little to do with your challenge performance. In fact, being too good at challenges is a good reason for people to vote you out the first chance they get. 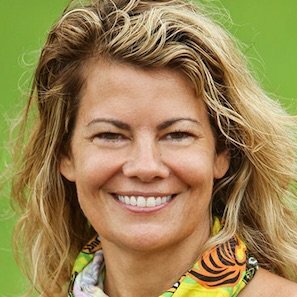 And, the one person that has won Survivor twice, Sandra Diaz-Twine, has never won a single individual challenge. 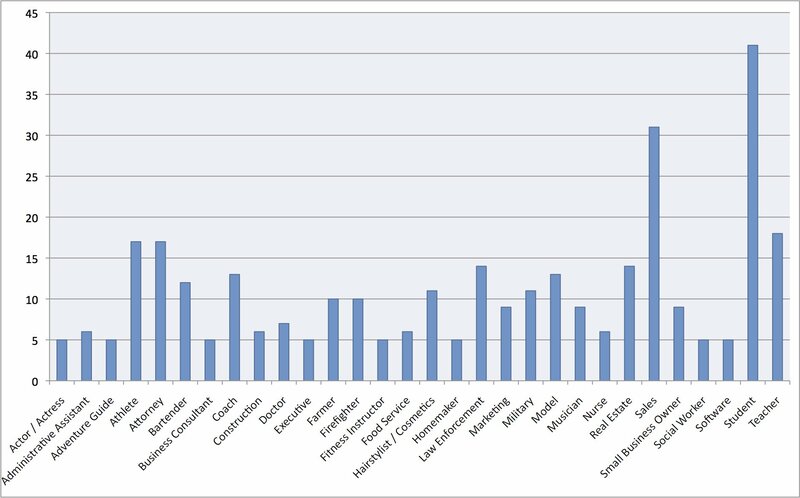 Taking a very results-oriented approach to evaluating success, we took our top 30 most common occupations and calculated the average finish placement for each category. The results are shown below organized by best average finish to worst. 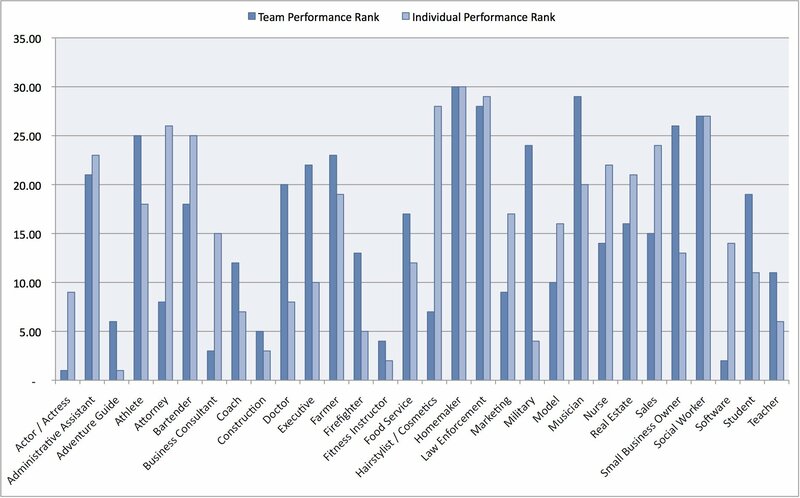 The triangles represent the average finish for a category, while the top and bottom of the vertical lines correspond to the worst and best finishes for contestants with that profession. The story told for those with a law enforcement background is not a great one. Survivor pre-merge trips is littered with police officers, FBI agents, sheriffs and the like. Besides the one bright shining star within this category of Survivor Cagayan winner Tony Vlachos, who actually lied about what his occupation was, the average law enforcer lasts less than 12 days! Only three law enforcers have even made it to the jury. As a police officer, you have almost an 80% chance of being voted off prior to the merge. This is far more than any other category. If you are an officer and planning to be on the show, it may be your best move to follow Tony’s lead and lie about your job. Another category that is consistently cast for the show, 17 times in fact, but historically has poor performance is attorneys. There has never been an attorney win the game even though it is the 5th most common casting career type. On the other side of the spectrum, we have a number of professions with consistently strong finishes. Below, we show the best finisher for each of the top 5 performing categories. Each of these five job types have relatively low frequency, only five appearances each, so one really good performance can definitely impact the average. If we consider only the top 10 most common job categories, the best performing occupation is a coach. There have been 13 coaches on Survivor with an average finish between 7th and 8th place overall. Memorable coach contestants include ex-NFL coach Jimmy Johnson, triathalon coach Alex Bell, and of course, women’s soccer coach Coach Ben Wade. Does perhaps a coach has the right mix of physical, social and strategic prowess to consistently succeed on Survivor? They can rally their tribe together as a team, build trust with other contestants, and do well in challenges. 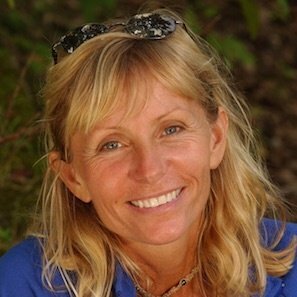 Is a coach the greatest career path to prepare for success on Survivor? 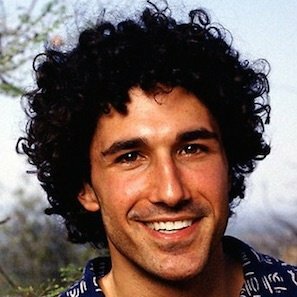 Out of the long tail of 50 careers that have only come up once in the history of Survivor, which includes jobs like fish monger, phlebotomist, and mechanical bull operation, there have only been two winners. These winners are office manager Vecepia Towery and mental health professional Denise Stapley. This deep dive into the careers of Survivor contestants has led to a lot of interesting findings. Below, we summarize the key takeaways discussed in this post. Survivor loves to cast students, teachers, attorneys, athletes and pharmaceutical sales reps.
On average, executives and military personnel are the oldest constestants while students and adventure guides are the youngest. The sweet spot for a winner is between 31 and 32 years old. Old enough to have some life experience but young enough to survive the elements and challenges. 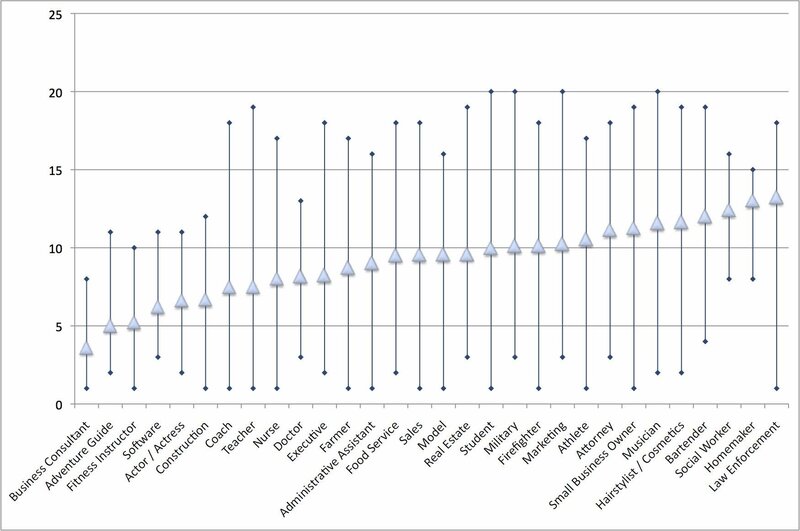 The most consistent tribal and individual challenge performers are teachers, actors, adventure guides, construction workers and fitness instructors. Yoga seems to be great preparation for challenge dominance. 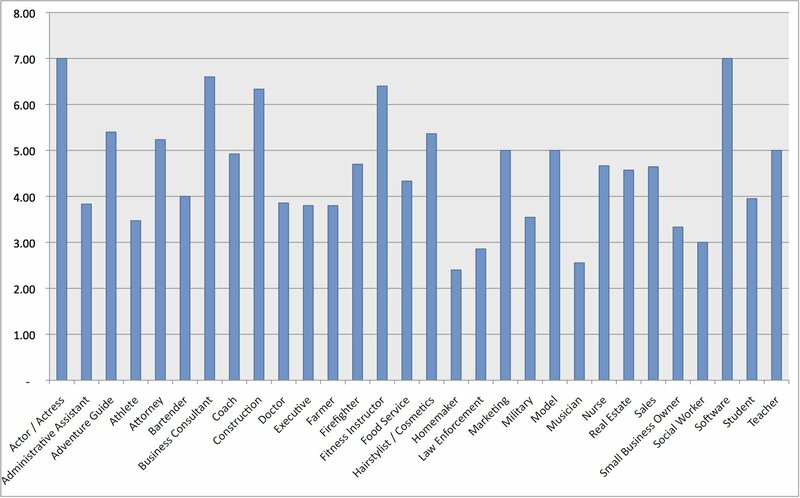 Contestants working in law enforcement, on average, are the worst performers on the show. You have close to an 80% chance of going out pre-merge entering the game in a law enforcement profession. 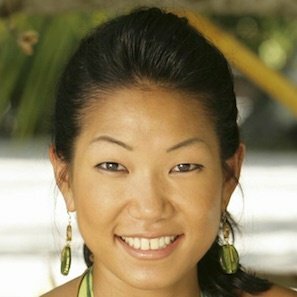 Coaches have the best overall record out of the 10 most common careers seen on Survivor. They appear to have the right mix of social, strategic and physical prowess. There appears to be a consistent theme between performing well on Survivor and coming from a career that requires working with teams where you build consensus or need to relate to a large variety of different types of people. Business consultants, fitness instructors and coaches work with an ever-changing set of people. They are in positions where they are teaching, but not dictating. They have to inspire or manipulate people to do what is they want done. Conversely, occupations like law enforcement, military, or attorneys, where the day to day social dynamic is very different from those of a consultant, are part of the bottom half of the average placement on Survivor. Unfortunately, these three professions potentially carry certain negative stereotypes that might hurt a player’s chances. In the early part of the game, people are looking for any excuse to get rid of someone as long as it is not them. Feeling negative towards someone because they are a police officer and you got a speeding ticket last month or an attorney and you hate Matlock, might be too much prejudice to overcome. What findings are you surprised by? Why do you think some occupations perform worse than others? 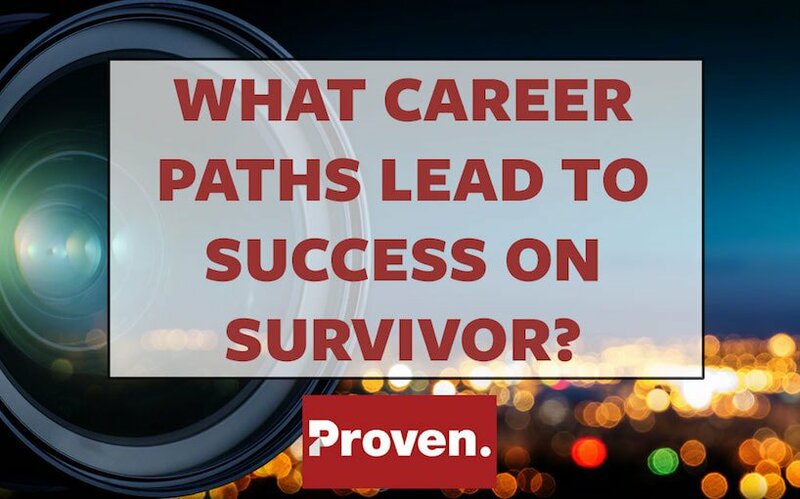 How has your career path prepared you for success in Survivor? 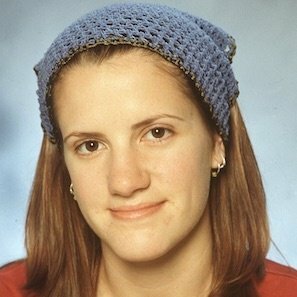 Want to to give special thanks to True Dork Times and the Survivor Wikia for aggregating much of the data used in this post.